I got a sad email today from Jeff Stumb, the Director of the Great Race about the deaths of two Great Race participants who were involved in a life or death experience this summer on Mount Washington during the Great Race. Scott famously used his car on Mount Washington to stop another competitor’s vehicle from rolling off the the road down Mount Washington after the competitor’s car lost its brakes. This whole incident was captured on video, which I have seen. The Buick station wagon was initially behind the Mustang going down the Mount Washington access road. The heavy Buick with old drum brakes began to suffer from massive brake fade. The Buick navigator began to holler out the window that they had lost their brakes. In no time the Buick passed the Mustang because they could not slow down. This situation looked ominous. On the outside of the next corner there were some rocks. Rather than risk going off the mountain, the Buick driver chose to make contact with those rocks. The Buick rolled over on the passenger side and initially appeared to be stable, at least for a second or two. Then the Buick flopped back down on its wheels and began to roll toward the edge of the road and a very significant drop. Scott Henderson, with his daughter as navigator, moved his Mustang in front of the Buick, allowing the Buick to use the Mustang as a stopping block and to stay on the mountain and probably save lives. Scott Henderson was awarded the Tom McRae Spirit of the Event Award at the Great Race finish in Halifax for his quick thinking. Everyone who knew Scott knew he loved life, he loved people, he loved his family (especially his daughter Mallory) and he loved the Great Race. Just before we left Halifax, several of us saw Scott and his daughter in the hotel finishing up breakfast. We offered our thanks and congratulations on winning the award for his actions. I remember that he said: “You’d do the same thing.” to which my friend Peter McGuire replied: “Yea, but you DID it!”. That’s right – he did it. 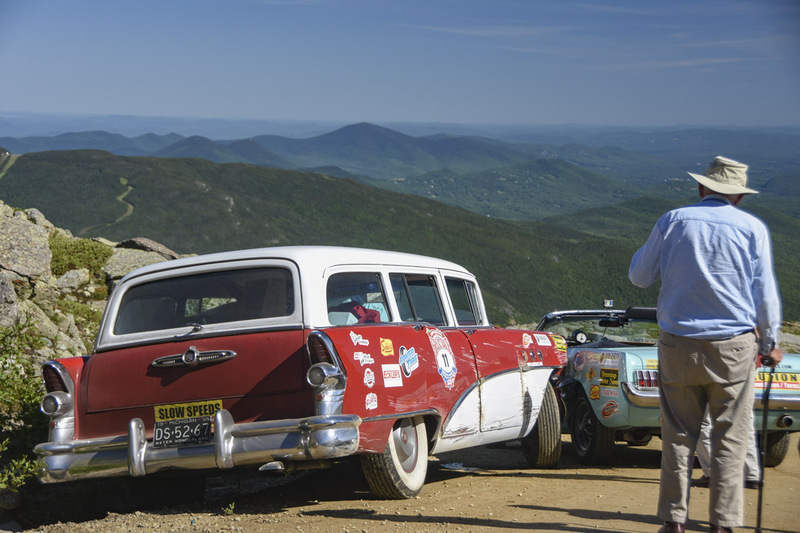 Sadly, and in an odd coincidence, Jack Juratovic, the driver of the 1955 Buick station wagon which Scott saved from a horrible fate on Mount Washington, passed away suddenly Tuesday at his home in Michigan. Two guys, forever linked in my mind, both passed shortly after that event on Mount Washington. Very sad. This entry was posted in Uncategorized and tagged Great Race. Bookmark the permalink. A moving tribute Steve.Thanks for sharing.